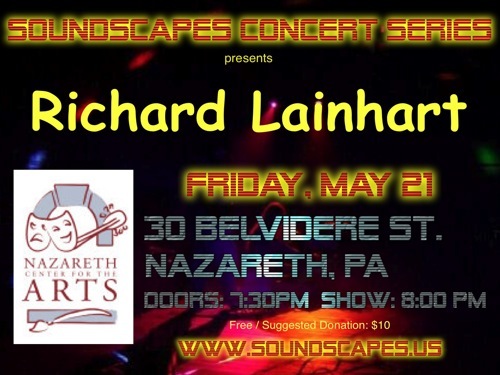 Here is the archive of Soundscapes Concert #6 featuring Richard Lainhart. It took place at the Nazareth Center for the Arts on Friday, May 21, 2010. The doors opened at 7:30 pm when the crowd was greeted by a CD playing music by Mahoney and Peck who recently were featured on Galactic Travels. Thanks to Ross Nunamaker and the volunteers of the Nazareth Center for the Arts for providing refreshments and help. Richard played two sets, improvising soundtracks to his own movies. For the first set, Richard played a Haken Continuum controller and a Buchla 200e analog synthesizer. He played a guitar processed by a laptop for the second set. Richard Lainhart is an award-winning composer, author, and filmmaker - a digital artisan who works with sonic and visual data. Since childhood, he's been interested in natural processes such as waves, flames and clouds, in harmonics and harmony, and in creative interactions with machines, using them as compositional methods to present sounds and images that are as beautiful as he can make them. Lainhart studied composition and electronic music with Joel Chadabe at the State University of New York at Albany. He has composed music for film, television, CD-ROMs, interactive applications, and the Web. His compositions have been performed in the US, England, Sweden, Germany, Australia, and Japan. Recordings of his music have appeared on the Periodic Music, Vacant Lot, XI Records, Airglow Music, Tobira Records, Infrequency, VICMOD, and ExOvo labels. As an active performer, Lainhart has appeared in public approximately 2000 times. Besides performing his own work, he has worked and performed with John Cage, David Tudor, Steve Reich, Phill Niblock, David Berhman, and Jordan Rudess, among many others. He has composed over 150 electronic and acoustic works. In 2008, he was commissioned by the Electronic Music Foundation to contribute a work to New York Soundscape. Lainhart's animations and short films have been shown at festivals in the US, the UK, Canada, Portugal, Italy, France, Spain, Germany, and Korea, and online at Souvenirs From Earth, ResFest, The New Venue, The Bitscreen, and Streaming Cinema 2.0. His film "A Haiku Setting" won mentions in several categories at the 2002 International Festival of Cinema and Technology in Toronto. In 2009, he was awarded a Film & Media grant by the New York State Council on the Arts for "No Other Time," a full-length intermedia performance designed for a large reverberant space, combining live analog electronics with four-channel playback, and high-definition computer-animated film projection. In January 2010, he performed as a featured Live Media audio-visual artist at Netmage 2010 in Bologna, Italy. [His] "music reflects the spirit of possibility that once defined electronic music, bringing with it a sense of past, present and future that transcends time, technology and cultural assumptions. The spell-binding music seemed to evoke feelings that can't quite be named, and suggest music I might rather imagine for myself in silence than trust most composers to compose." You can find examples of Richard's music and digital artworks at his website. You may view some of his short films and samples of his demo and training videos.